Two major types of waste materials are present on the peninsula: coal tars and purifier waste. Coal tars are reddish brown, oily liquids which do not readily dissolve in water. Materials such as this are commonly referred to as a non-aqueous phase liquid, or NAPL. Although most tars are slightly more dense than water, the difference in density is slight. Consequently, they can either float or sink when in contact with water. Tars were disposed, or spilled or leaked from tanks, gas holders, and other structures at several locations throughout the peninsula, and have moved laterally away from these locations through the subsurface. Near the ground surface, some of the tars have weathered and partially solidified. In these areas tar is found in thin crusts on the ground surface, and fresh seeps of tar can be seen breaking through the crust when the weather is warm enough to allow the tar to liquify. Elsewhere, the tars retain their original, oily fluid properties and may still be capable of moving slowly through the subsurface. Purifier waste is a mixture of wood chips and iron filings which was used to remove sulfur and other compounds from the manufactured gas before the gas was distributed to the public. Purifier waste which was no longer capable of removing the impurities was often disposed on site. It contains high concentrations of sulfur and cyanide and has a characteristic blue color. The main categories of contaminants which exceed their New York State standards, criteria or guidance values (SCGs) are volatile organic compounds and semivolatile organic compounds. The main volatile organic compound of concern in soil and groundwater is benzene. Specific semi-volatile organic compounds of concern in soil and groundwater are polycyclic aromatic hydrocarbons, referred to as PAHs. These are the compounds that make up tars and asphalt. 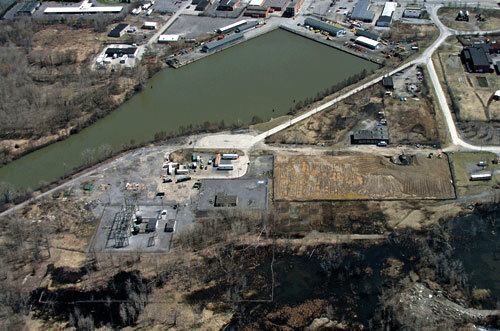 Remediation of releases and impacts at the Harbor Point site is being addressed by National Grid and overseen by the NYSDEC and New York State Department of Health (NYSDOH). The site has been divided into three "Operable Units" for which remediation decisions will be made. Operable Unit 1 is the land portion of the Harbor Point Site. Operable Unit 2 is the Mohawk River. Operable Unit 3 is Utica Harbor, the dredge spoil areas adjacent to the Harbor and storm drains on the Harbor Point site that lead to the Harbor. Records of Decision (RODs) for OU-3 (March 2001) and (March 2003) stipulating the required remedial actions have been issued. A draft feasibility study has been submitted to NYSDEC for Operable Unit 2 (the Mohawk River). Institutional controls to limit development to nonresidential uses, prevent groundwater use as a drinking water source. Cleaning, lining or plugging of storm sewers leading to the Harbor. The remedy for the Mohawk River (OU-2) is yet to be determined. The Harbor Point project is now in the construction phase for Operable Units 1 and 3 and the development of a Feasibility Study for Operable Unit 2. Field work for the construction phase in Operable Units 1 and 3 began in 2008. However, it is important to note that Interim Remedial Issues to address environmental conditions on portions of the site began in the 1990’s and early 2000’s, including completion of a barrier wall adjacent to the former Manufactured Gas Plant operational area in 2008. The work completed to date is shown on the Homepage. Soil extraction, treatment, and disposal associated with the former Coal Gas Plant. A portion of the remedial work for Operable Unit 3 is the responsibility of and implemented under the control of the Canal Corporation, which has previously completed the capping of one contaminated area and will be excavating another (known as DSA-2) in the summer of 2009.